An irresistibly-brilliant graphic novel adaptation of The Graveyard Book by Neil Gaiman, adapted by award-winning illustrator P. Craig Russell. This is the first of two volumes. Nobody Owens, known as Bod, is a normal boy. He would be completely normal if he didn't live in a graveyard, being raised by ghosts, with a guardian who belongs to neither the world of the living nor the dead. There are dangers and adventures for Bod in the graveyard. But it's in the land of the living that the real danger lurks, for it is there that the man Jack lives, and he has already killed Bod's family. Each chapter is illustrated by a different artist, with contributions from P. Craig Russell, Kevin Nowlan, Tony Harris and Scott Hamptom, Galen Showman, Jill Thompson and Stephen B. Scott. I was pleasantly surprised when I received this book for review. The first thing I did was flick through the pages, and enjoyed looking at the brilliant artwork. This is the first part in the graphic novel adaptation of Neil Gaiman's The Graveyard Book, and contains chapter one through to the interlude. Nobody Owens is a normal boy living a not-so normal life. His family was killed when he was a baby, and lucky for him he happened to sneak out of the house before it was his turn. Now he's older and has been living in a graveyard, where the ghosts are raising him and a guardian who found out the truth about Bod's family has granted him permission to stay and watches over him. This book captures the original story very well, showcasing it through a visual medium that definitely works. Each chapter was illustrated by a different artist, and each one puts their own spin on the story. While still managing to make it feel like the same book. 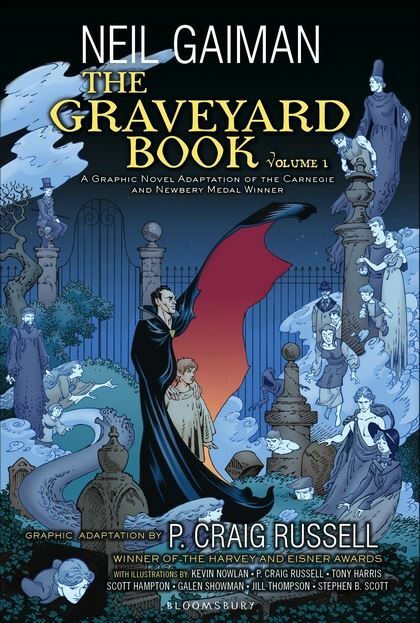 The Graveyard Book Graphic Novel, Volume 1 is a lovely book that enhances Neil Gaiman's story, once again captivates readers, and might even grab a new audience along the way. It really is a gorgeous book. I look forward to reading the next one.